David B. is his own invention, a new self-made identity created by Pierre-François David Beauchard. He saw it as a way to restore the name David, which his mother originally wanted him to have, but his anti-semitic grandfather objected to. It was also a way to redefine and distinguish himself from his sometimes harrowing childhood dealing with his elder brother Jean-Christophe’s epilepsy. As his parents would never discuss the illness as he grew up, David B. embarked on an autobiographical account in comics form in his Thirties in an attempt to open a dialogue with them. This resulted in Epileptic, one of the most affecting family testimonies in comics since Art Spiegelman‘s Pulitzer prize-winning Holocaust memoir Maus. 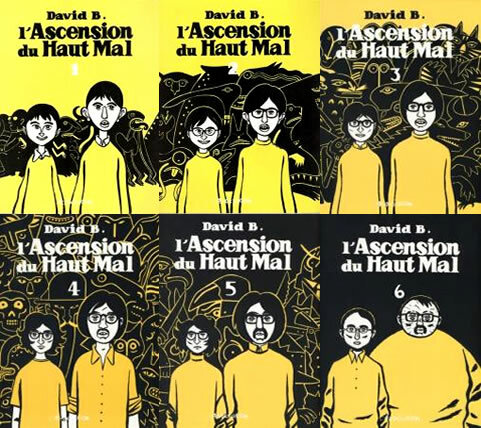 With unflinching honesty, David B. made this very private family trauma public in six bande dessinée albums serialised as L’Ascension du Haut-Mal between 1996 and 2003, which were then compiled in 2005 into one 360-page graphic novel in English as Epileptic from Pantheon and Jonathan Cape. 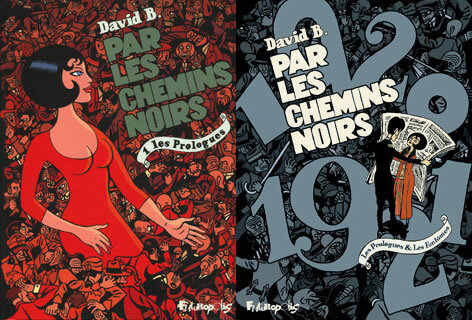 Here David B. shows us the literally formative experiences which shaped him into one of France’s most daring and fascinating graphic storytellers. Epileptic has its share of surreal, even absurd scenes. Rejecting high-risk surgery, his parents experiment with every alternative treatment possible, from macrobiotic diets to esoteric spiritualism. His parents search doggedly but in vain for a cure from a parade of gurus, quacks and spiritualists. David B. tales a matter-of-fact, non-judgmental tone to all this, in contrast with his emotionally intense imagery. At one point he admits how as an adolescent he mistreated his brother, once almost letting him kill himself. David also explores how both his childhood inner rage and fantasy life helped to protect him by transforming the family’s struggles with the illness into symbolic battles. 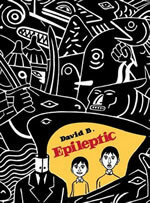 David B. visualises his brother’s epilepsy as a sinister dragon, slithering through their lives and stalking him as well. To save his brother and himself from the disease, David B. sees himself as warrior in a terrible battle. At first, David B. shows the illness as an external menace, gripping Jean-Christophe in its coils or sharp teeth, whenever he has seizures. But as his condition worsens, David realises that his brother is giving in to it and draws brother and monster merging into one, never to be separate again. Illustrating the shadow world of his imagination is an affirmation that he will not succumb to epilepsy. As he asserts in the book, “My armour is the night”. David B. blends factual research and fictional romance in the book’s hero Laureano, a man of letters and former soldier, never wearing his uniform again, who cannot forget a comrade he lost in combat. “I learnt that it was only after the World War 1 that doctors understood that people could become ill from the war. At the beginning of the war, when a soldier had a nervous breakdown, doctors would say that he’s simply a coward. After, they understood that even the bravest men could not withstand being attacked every day in the trenches. Laureano is haunted by the ghost of the war and I think the city of Fiume was also haunted by that, by all this chaos, all of the past. 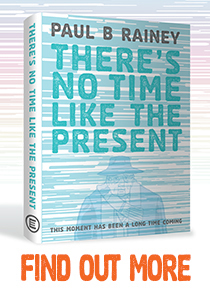 People wanted to move into the future, but they were pulled down by the past.” From visceral thrills to burgeoning love, from historical background, narrated in symbolic or poster-like graphics, to the bizarre climax featuring a stolen statue of Saint Francis of Assissi sporting a pair of revolvers, this is a gripping evocation of a forgotten but unforgettable slice of yesterday. 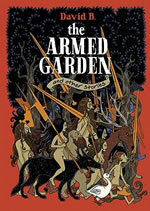 Battles and quests from more remote times and lands fill the trilogy of tales in The Armed Garden, recently released by Fantagraphics. From 8th century Persia, David B. conjures up the Arabian legends of A Thousand and One Knights in ‘The Veiled Prophet’, while its pair of sequel stories revolve around the search for Eden itself in the 15th century by Adamite Rohan from Prague, and his arch rival, the Taborite Jan Ziska. 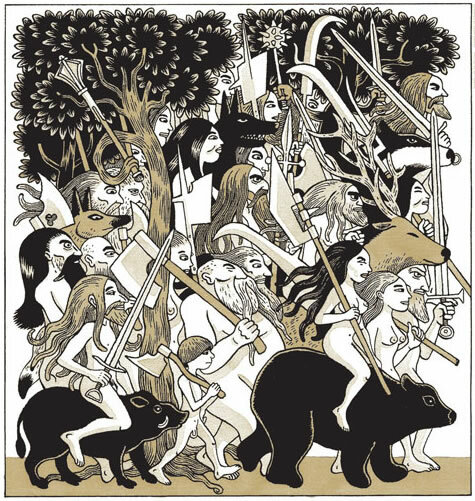 No dreary school lessons, these comics bring history’s complexities to vibrant life. 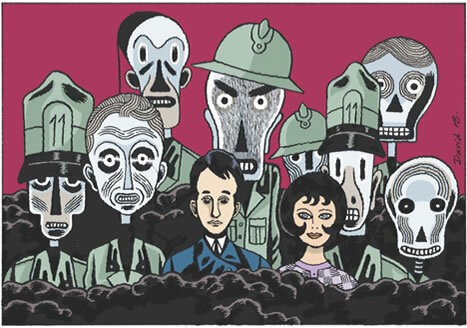 Along similar lines, his latest project, set for translation next year from SelfMadeHero, is The Best of Enemies, a three-part project analysing the secret history of relations between the United States and the Middle East, co-written with historian Jean-Pierre Filiu. Their first volume covers from 1783 to 1953. What comes a shock is that these complex antagonisms date back as early as the 18th century and the birth of America itself. Equally alarming are the American, and British, machinations to secure oil and secure regime change by restoring the Shah in Iran. 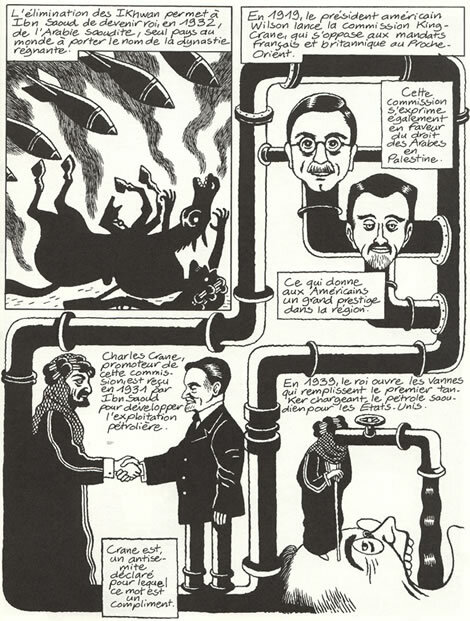 These are hugely relevant and sometimes scandalous revelations which comics can make much more accessible. How can teachers make history boring in class when it’s as extraordinary as this? David B. works instinctually. “I don’t plan, I don’t write scripts, I like surprises to happen on the page.” But he does strive for a rhythm in his pages. “Some are more abstract, others more concerete and I play with that. I don’t want to always give the same impression. Some comic looks the same all the way through in composition and colour composition. 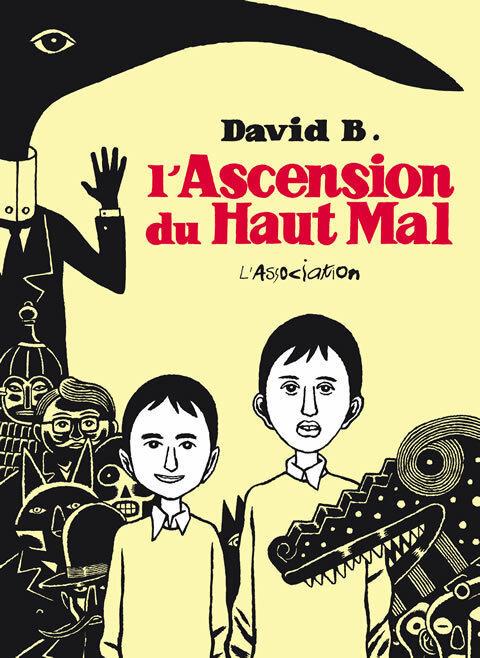 I prefer ‘un livre pensé’ (‘a thought-out book’), where I can see that someone thinking about what he is doing.” David B. is busier than ever, also working on a third episode of Babel underway, expanding on themes in Epileptic, and newly appointed as President of L’Association. His ever-growing body of thoughtful work becomes more layered and interrelated with every addition. 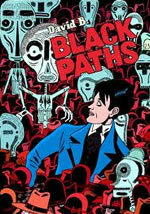 Here is a transcript of my Comica Conversation with David B. for the launch of Black Paths at the London bookshop Clerkenwell Tales on 30 June 2011, some of which was used for the above article. What fascinated you about Fiume and D’Annunzio? What I like in the story of Fiume is that it is the concentration of all the problems after the end of the First World War. Fiume is a city on the Adriatic and after WWI both Italy and the new Yugoslvia reclaimed this city and the Allies gave the city to Yugoslavia. The poet Gabriele D’Annunzio decided to keep the city for Italy. He was very involved during WW1 sending Italy into the war. Italy entered in 1915, he was in the pro-war movement. He liked France very much and wanted Italy to be on the side of the French. After the war he occupied Fiume with volunteers in Italy, young soliders, intellectuals, artists, he took it and said it is Italian. The majority of them was Italian, with a a few Hungarian or Croatian. Was it a Yugoslav city before? This is always confusing, Beforehand it belonged to Austria, as part of the Austro-Hungarian Empire, as Croatia in the Middle Ages was part of Hungarian kingdom, so Hungarians were there with the Italians against the Slavs. The Italian govenment could not not accept this so they encircled the city and asked D’Annunzio to return the city to Yugoslavia but he refused. So this situation went on for one year. Finally the Italian government attacked the city and D’Annunzio was obliged to leave the city. The story of Fiume in this period is not only a war story. D’Annunzio was a poet, a writer, very famous in the early 20th century all over Europe. He was very curious and modern, for example he was one of the first writers in Italy to write scenarios for movies for the young Italian cinema, he was interested in art, women, alcohol, drugs! So it was kind of poetic republic he wanted to create here. Lots of intellectuals came here from all over Europe to create something new after the horrors of the First World War. He wanted an idealistic republic of artists and he succeeded at the beginning, but after the war was going on and the Fascist part of the people helping him seized power, all that collapsed. Around him were all kinds of people. He had contacts with anarchists, Fascists as well as with Catholics, Freemasons, revolutionaries, Futurists, Dadaists, and people who were more traditional. It was a pretty chaotic attempt at building a utopia. Yes, D’Annunzio tried to create something from all that and he succeeded for a moment but politics and reality took over. He was also a collector so everywhere he went, he takes his collection with him. He mixed up all kinds of things. He had this precious medieval statue of St Francis of Assissi and he put on it a belt with two guns that someone offered to him. It was his way to collect things, as an artist, also a surrealistic joke. Black Paths is a mxture of factual research and fictional romance. I created Lauriano, the hero, to talk about the people who get ill from the the war, Doing my research I learnt that after WW1 it was the first moment that doctors understood that peopke could be ill from the war. At the beginning of the war when a soldier had a nervous breakdown, doctors would say that he is simply a coward and that’s all. After, they understood that even the bravest men could not resist the bombardment every day, I wanted to speak about that. My character Laureano is haunted by the ghost of the war and I think the city of Fiume was also haunted by that, by all the chaos that was there, all the past. People wanted to go into the future, but they were pulled down by the past. You quote here the British General Wavell, who took part in the Treaty of Versailles: “After ‘the War to end War’ they seem to have been pretty successful at making a ‘Peace to end Peace’.” You give a real insight into the complete chaos of Europe after WW1. The War did not end in 1918. The War went on until 1939 and the Second World War, it goes on in Italy, Spain, China, the Balkans, everywhere there were little wars going on. I also tell this in the book. German soldiers in the 1920s were still making war against the Polish and the new Baltic republic. One soldier asked them, “The war is over, why are you still fighting?” and the German answered, “Who decides the war is over? We are the war. We decide.” That is the spirit of Fascism, Nazism, Stalinism. This young generation of people who discover themselves during the war, discover their violence and wanted to go on. You dealt with war in Epileptic through your grandfather who fought in WW1. My grandfather was in the First World War. Whenever I asked him questions about it, my grandmother would appear and tell me, “Don’t ask him questions about that! It will make him sad.” He never could tell me anything about that. My mother told me about that. He was a farmer and when he was outside, she could ask him because my grandmother wasn’t aroiund! So she learnt something. When I was young, my mother and grandfather were always together. 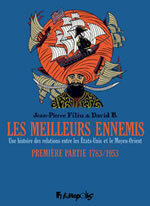 An excellent new French study of your oeuvre, Lectures de David B. from Editions PLG, offers an overview of themes, and how even the most historical or adventure-genre material has a link to your autobiography. 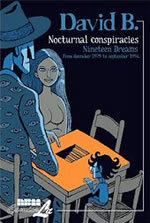 There is a natural coherence and links with every aspect of your comics, like Lauriano writing for the magazines Incidents de la Nuit, another of your series. I like very much to make links between my works. Incidents de la Nuit is a magazine I invented and I use it in Black Paths. Laureano is a journalist writing for a magazine which I invented in another book. I like to do this kind of things. In Babel, I speak also about illness and violence, of the world, the epilepsy of the world rather than the epilepsy of my brother. Does violence seem like an endless cycle? Do you have any sense of optmism of things getting better? Yes because I am doing books, and that is an optimistic thing. There is something darker, more black in my books but I am a kind of an optimistic person, I don’t know how to explain it. With the six volumes of Epileptic, I learnt to make comics by doing it. When I began the book, I was going towards something very dark and doing it I feel better in myself just by the fact of drawing, not specially psychologically. I like very much to draw in the material sense, just putting ink onto the paper makes me feel good. I can leave my pain on the paper, the act of drawing was like a medicine. I don’t plan, I don’t write scripts, I like surprises. When I was doing Babel 2, I was watching the Godard film and it was exactly what wanted to say and prompted me to decide what illustration can accompany that. So I decided on a more abstract image, it appeared just like that, from some ideas that are knocking together. You played an important role in the birth of Persepolis. 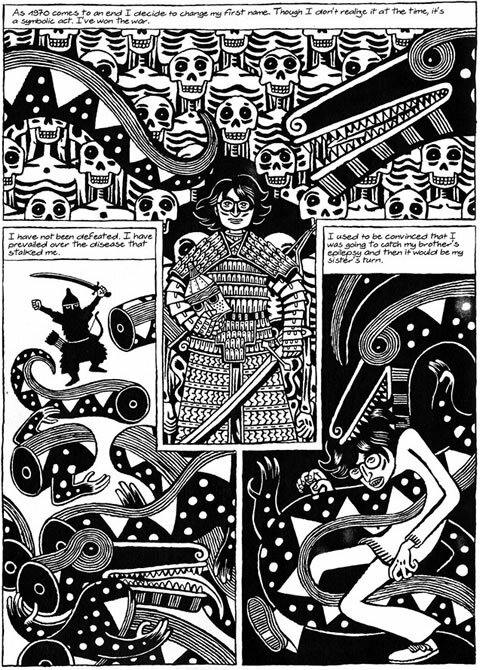 Marjane Satrapi would not have made the book without your encouragement and involvement. And I believe not everyone at L’Association was as enthusiastic about Marjane’s work as you were? No, but the least enthusiastic was Jean-Christophe Menu but the others were quite ok to do it. Menu was not keen at the beginning but when he saw the money coming in he changed his mind! (laughter). After a rocky period of employee strikes and internal tensions, I believe you are now M. President, you are the Sarkozy of L’Association! Yes, there was some trouble recently, because Menu took power at L’Association but it finished the beginning of this year. He made so many bad decisions, the employees went on stirke, and they asked for a General Assembly which had not been held for several years. So we did this, there were two lists of candidates, his list and our list, and we were elected so we are going back to L’Association. Now we are trying to go on and do new books. Treasurer is Trondheim, and Killoffer is secretary. How will L’Association be different? When Menu took power, he was alone. Before there was a committee to decide the books and we voted for vhe books. We will do that again. At first we were six, but now we are nine people. Trondheim is not in the editorial committee because he is already an editor at Delcourt so he does want to be involved in two different publishers, so he says I am with you but not on the committee. So there is also Killoffer, Mokeit, one of the orihginal founders, Matt Konture, me and Alex Baladi, Swiss artists Ruppert & Moulot, Francois Ayroles and Etienne Lécroart. Decisions to not have to be unanimous. If there is a majority decision then the book will be done. L’Asso has weathered this stormy period of change. Etienne is the coordinator of the committee and Lewis, Killoffer and I have an office. We decide on how things are run, there are lots of problems, every day I speak with lawyers. There will finally be a French integrale collection of Epileptic, with a new cover. Will the publishing programme of L’Asso change from Menu’s vision? Of course, it will be different, because before it was one man who decided according to his own taste, and now it will be a mix of the taste of nine people. So it will be something wider, not just his own vision. He was going with more abstract things. Menu was defiantly avant garde which was a good thing in many ways. Yes, we want to keep doing avant garde books but also other things. We will see. I have some different projects for L’Asso and I am also working on the third Babel for Futuropolis now, because the French publisher didn’t pay me. It will come out as a book in France, and in the US as a comic. Babel is open-ended. When I am doing my comics, I am telling a story so pages must have a rhythm in my book, some images are more abstract, others more concrete and I play with that. I don’t want to always give the same impression. Some comics look the same all the way through and I see quickly if there is something interesting told in an interesting way, if it’s ‘un livre pensé’, a thought-out book, where someone thinking about what he is doing.